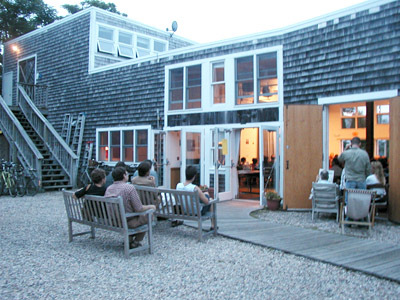 Mission: The Fine Arts Work Center, a non-profit enterprise, is devoted to encouraging the growth and development of emerging visual artists and writers through residency programs, to the propagation of aesthetic values and experience, and to the restoration of the year-round vitality of the historic art colony of Provincetown. Accommodations: Visual arts Fellows are provided with apartments and separate working studios of approximately 400 square feet of floor space. Additional facilities include a basic woodshop, a print shop with etching press and a large format digital printer. Writing Fellows are housed in two- to three-room apartments. The Stanley Kunitz Common Room is handicapped accessible, as are two living spaces and several working studios. Demographic: Fine Arts Work Center Fellowships are open to writers and visual artists in the emerging stages of their careers. Fellows may be citizens of any country. Juries of working writers and artists make the admissions decisions. Writers may apply in fiction and poetry. In the visual arts, 2D, 3D and time-based work is considered. The Fine Arts Work Center actively seeks applicants from diverse cultural backgrounds. The Fine Arts Work Center welcomes family members and partners of Fellows during the Winter Fellowship Term. Benefits: Fellows are expected to live and work in Provincetown during the fellowship year. Optional group activities provide Fellows with the opportunity to meet program committee members as well as visiting artists and writers. The Stanley Kunitz Common Room is the site of frequent presentations by distinguished guests as well as readings by writing Fellows. Visual arts Fellows present shows in the Work Center’s Hudson D. Walker Gallery. Visiting artists and writers engage in dialogue with the Fellows throughout the year. The Fine Arts Work Center also seeks to identify local and national venues for Fellows and former Fellows to share their work. Deadline: Writing Fellowship: December 1 and Visual Arts Fellowship: February 1. Posted in Fine Arts Work Center, MassachusettsTagged 2D, 3D, American, apartments, Art, art library, art residency, Artist, Artist Residency, arts, Communal, community, Contemporary Art, Drawing, emerging visual artists, emerging writers, etching press, Family members welcome, FAWC, Fellowship, Fine Arts Work Center, Gallery, Guest Artists, guests, guests welcome, large format digital printer, Large format printers, Long-term, MA, Massachusetts, Painting, performance art, Photography, Photography Residency, Print Shop, Printmaking, Printmaking Studio, Provincetown, Rate My Artist Residency, Social Practice, Stipend, Studio, studio space, Time-Based, United States, video art, Visual Arts, Winter, Winter Residency, workspace, Writers, WritingBookmark the permalink.